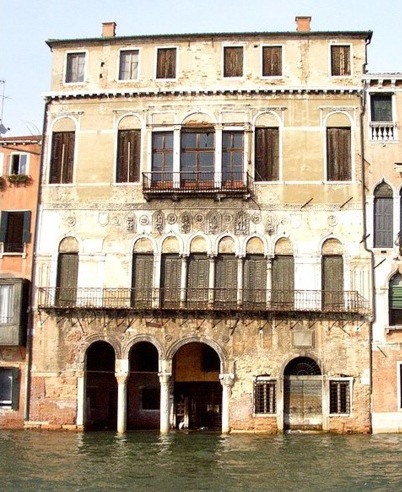 This rather shabby looking 13th-century Veneto-Byzantine palazzo is the oldest on the Grand Canal, and architecturally one of the most important in Venice, having started out as a merchant's fondaco with living quarters on top. Its narrow arches, with just a hint of the peak at the top, were a landmark on the way to the full pointed arch of Venetian Gothic. It was the birthplace of Alvise da Mosto (or Alvise Cadamosto, d. 1483), who was the first European to sight the Cape Verde islands while in employed as a slave-trader by the Portuguese king Henry the Navigator. His first-hand description of his discoveries, the Navigazioni, remain one of the most important documents from the early days of the Age of Discoveries. The Da Mostos (ancestors of architect, historian and BBC television presenter Francesco da Mosto) kept the palazzo until 1603, when Chiara da Mosto (who married four times and became one of the wealthiest women in Venice, but had no children) fell out with her family and left her entire estate to Leonardo Donà dalle Rose, a nephew of her second husband—and future Doge. The Donà had plenty of newer and bigger pads around Venice, so rented the old pile out. It became famous as the Locanda del Leon Bianco, the equivalent of the Ritz of Venice into the early 19th century. When Holy Roman Emperor Joseph II came to visit Venice in 1769 and 1775, he checked in here. Afterwards it fell into decline, and because the bottom floor has flooded, it now stands empty. The palazzo was used as a location in The Talented Mr Ripley (1999). Also see Around SS Apostoli.